I tried really hard to avoid Mexican Food for the above theme. I wanted to try something different but sourcing some of the ingredients was proving to be a task. I wanted to make arepas but getting some pre cooked white corn meal was difficult. The staple diet in Kenya is ugali made from white corn meal or flour but the corn is not pre cooked before it is ground. While I was doing some research on the Latin American Cuisine, (which by the way is so similar and may vary in small degrees, depending on which country it is from) I came across Flautas. What attracted me to the recipe was the name. Flautas (pronounced as fl-ow-tahs) means flute. Flautas are rolled much thinner than burritos. Flautas are fried. That makes them crispy and crunchy. Sometimes they are filled with breakfast ingredients and served for breakfast. They are usually served on a bed of lettuce or any salad greens.Enjoy this dish for lunch or dinner. I cannot make up my mind as to which of the Mexican dishes are my favourite. I love them all. Mexican cuisine is basically a fusion of the indigenous Mesoamerican cooking and European, mainly Spanish and later with influences from the African slaves and Asians. The staples for the natives were corn, beans, avocados, tomatoes, chillis and cocoa. The Spanish brought with them rice, meats, dairy products and a variety of herbs and spices. Sift the flours, salt and baking powder together into a big bowl. Form a dough using the warm water. Don’t put all the water at once. Knead into a soft dough. Rest the dough for 20-30 minutes. Heat a frying pan, griddle or tawa over medium heat. Using some extra flour roll out the one part into a 6-7″ diameter circle. Put the rolled tortilla on the hot tawa or griddle. Let it cook till small light brown spots form. Flip it over and cook. Place on a tea towel and cover it. Repeat steps 8-10 with the remaining dough. Add onions and stir fry till they are soft. Add garlic and the salsa sauce. Cook for a 2-3 minutes. Add the beans, paprika, salt and pepper powder. Mix well. Cover the pan and cook for a 2-3 minutes. Take the pan off the heat. Mash the beans lightly. Chop the boiled eggs and add to the bean mixture along with the coriander and lemon juice. Take one tortilla and place about 2 tbsp of the bean mixture about 1 inch from the top of the circle. Don’t put the filling till the edges. Cover the filling with the top part of the tortilla and then roll it up like a swiss roll. Secure the edge with a toothpick. Repeat steps 1-3 with the remaining tortillas and filling. Heat about ¼ – ½ inch layer of oil in a wide frying pan. Place the rolled flautas in the hot oil and let it fry till its crispy and light golden brown. Using tongs, turn it over and fry till its light golden colour and crispy. You can fry 2-3 flautas at a time depending on the size of the frying pan. Put a layer of lettuce on a serving plate. Place 2 flautas on it. Drizzle salsa sauce, guacamole or sour cream or all on top. Sprinkle some cheese, tomato and coriander on top and serve. If you are going to use ready made tortillas then warm them on a tawa or griddle before you roll them. You can use any sauce of your choice. I served the flautas with some chopped tomatoes. You can add any veg of your choice. This looks interesting and tasty,crispy from outside with nice filling like spring rolls. Yes the name is catchy ! 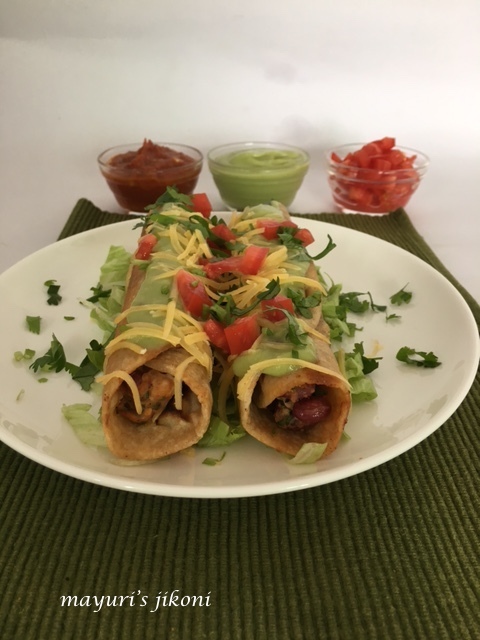 And these flutes ,… oops flautas look interesting , I love Mexican too so these will definitely feature soon in my menu. Wow that's such a filling meal you have assembled there! Lovely roll.. Just loved d filling used!! Omg, wish i get those veggie flautas rite from lappy screen, how prefect they looks, fantastic dish Mayuri. These veggie flautas sounds interesting, I love Mexican cuisine quite a lot actually. Great for lunch. Nice and yummy flautas.. I always eat Mexican food when I travel to USA. These are a kind of fusion dishes. When I went to Mexico I found they had more traditional food. I love the sound of these and the fact that they are crispy and golden brown on the outside with all the delicious filling in side. Wow, these are delicious. I love the very idea must try. Flautas have been on my to-make list for quite a long time. Your recipe is tempting me to try them out soon. Oh wow that looks very tempting, love the droolicious toppings and so beautifully presented!